How do I get statements for $1 to $2.50 per employee? 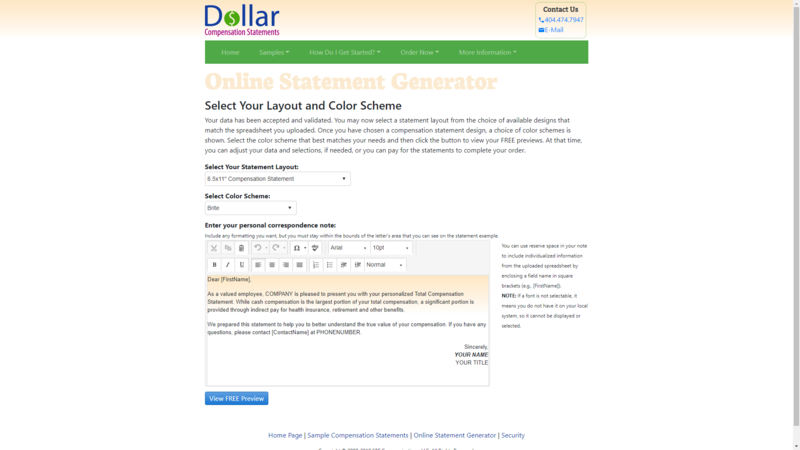 Use our cloud-based online statement generator to produce your print-ready Total Compensation Statements. Once I have the data ready to go, how long will it take to get the statements? 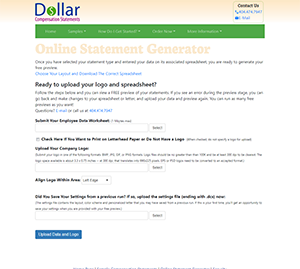 The online statement generator creates statements at the rate of about one statement every second. So, for example, generating statements for 100 employees will take about 2 minutes to complete. Can I test it for free? Choose the layout you like and download the corresponding Excel spreadsheet to your desktop. We have several different layouts designed by professional communicators to meet your needs. Choose the layout you like and download the corresponding workbook/spreadsheet and save it to your desktop. Paste your employee data into our spreadsheet. You will find two spreadsheets identified in the tabs at the bottom of the spreadsheet, one for Standard Data that includes basic plan or company information, and the other for personalized, employee-specific data. Please do not change the format of the data in the columns or add or delete columns in the spreadsheet. You may perform calculations within the spreadsheet and the generator will pick up the values, however if you are doing vlookups it is better to paste in values in case you need to send us the spreadsheet for help. Go back to the online statement generator and upload your spreadsheet. After you upload your spreadsheet and company logo the screen will change and you can type in your letter to employees. Next you will have the option to download a FREE preview of all of your statements or just the first five. If you see an error, go back and change your spreadsheet and upload it again. If you change your mind about the layout or want to try different ones, you can move your data to a different spreadsheet, choose a different layout and start over.